For many, turning 30 is a huge milestone. Life begins getting serious. You start thinking about your future and what you (really) want out of life. In fact, when you’re 16, 30 seems like 65. Then your 30th birthday hits…and so does the depression. (This is especially true for those of us who felt lost in our teens and twenties). But something happens: Just when you think you’re wandering aimlessly along the dirt road of life, you find that you’re not wondering aimlessly at all. Each job you’ve held, each friend you had, each life phase you experienced was not meaningless—in fact, it was merely a precursor to the next job, friend or life phase you’re in now. Even if it seems your life has gone down the drain due to crappy choices, there IS a method to the madness that disguises itself as a “waste of time”—the job you hate, the relationship you regret, or the worthless degree that left you in student loan debt up to your eyeballs. But you’re not lost. You’re just not clear on what you want (yet). Most people give up just before the miracle. Others don’t work hard enough at something to get good at it. Either way, if you’re 30 or older, don’t think for a SECOND that your life is over—because you’re just getting started. Contrary to what you’ve always been told, success is not a straight line. It’s a series of inclines, declines, peaks and valleys. 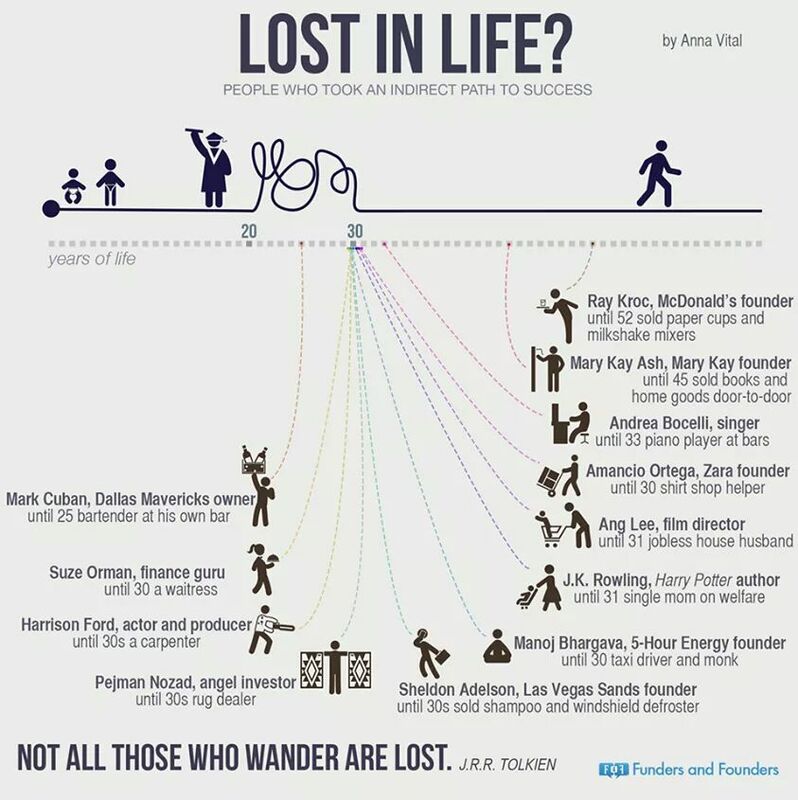 There are so many people that got their first big break after age 30, 40, 50 or even 60. Success is not a straight line. It’s a series of inclines, declines, peaks and valleys. There are so many people that got their first big break after age 30, 40, 50 or even 60. One thing these successful people have in common: they didn’t count themselves out. Who would have thought that a carpenter like Harrison Ford would become Indiana Jones? The story goes that George Lucas hired Harrison to build cabinets and at one point asked him to read the script he was working on for a little character named Hans Solo. The rest is history. Harrison didn’t count himself out because he was over 30-or because he was currently doing something he wasn’t thrilled about as a career. When the opportunity presented itself, he was willing to take a chance on success. There are all these beliefs floating around like airborne viruses. Beliefs about age, what’s possible at what age, what success is supposed to look like, how long it’s supposed to take and what age it is supposed to happen. But what if all these beliefs are wrong? Many people think it’s too late to start a business in their 30s, 40s, 50s or 60s. It takes too long to build up a company or it’s just too big a risk at this point in their life. They can’t lose their 401K or medical insurance. Bills and debts have to be paid. Which is why it’s very hard to convince people that entrepreneurial success is possible after 30. There are too many examples of business successes later in life to chalk up to “luck” or an anomaly. Let’s take the founder of Pandora, Tim Westergren. He started the company at 35 years old, with no prior successes. He was a failed jack-of-all-trades up until then. Even Williams, the co-founder of Twitter, started the social media giant at age 34. Lynda Weinman founded the billion dollar company, Lynda.com at 40 years old. And the list goes on. In fact, business success works opposite from careers like sports or modeling, which require physical youth to be on your side. As an entrepreneur, your collection of failures and successes over the years works in your favor—if you learn from them. Experience comes with living, so the longer you’ve alive provides more experience to source from. Of course, learning a new skillset is challenging when you’re older, as we tend to be more set in our ways with more mental blocks than our younger, naïve selves. This is where perseverance comes in. Never, ever giving up or giving in. Thinking big and staying focused on your short-term and long-term goals. Your life is not over, not by a long shot. Is making an app your business dream? Tepia Co can help.